What Stops You From Creating Content – Wilson K.
Someone actually asked this question on Quora, and I gave my reply. I thought it might be interesting to see how the blogging community differs from the Quora one, since they tend to be more to the point and focused on facts, while the WordPress crowd seems to be more whimsical and emotive. Lemme know what you think of my answer to the question. Why is the percentage of population that writes online content so much smaller than those who read it? This can only be explained as a journey. I’ve only started blogging about 2 months back. When I first started, I was scared stiff. My mind is total blank, and everything i thought I might post, sounded like a very bad idea. What if people don’t like me… what if… what if. These are the people who actually attempt to write. Like most people, I resorted to the Tumblr-style of blogging, taking other people’s content and posting in on my blog. Wheee I have a blog! Cute memes, gifs with inspiring quotes, lolscats, that was how I started my blog. And I believe this accounts for a good 90% of the remaining 5% of content out there. Reposts, repurposed, and represented content. I.e. 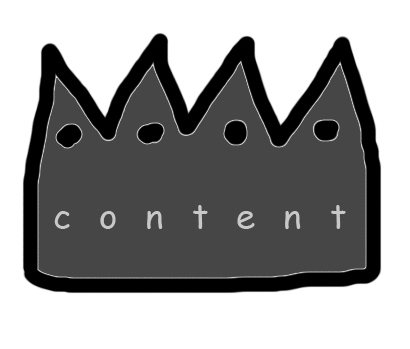 Using content off the internet to create content. This essentially means all social media content, 99% of all self-published blogs and online aggregators… that’s like 99% of web traffic right there. For me, one month on, still slightly self-conscious. I started writing opinion pieces on what I felt about certain things, but never truly writing a full post with all original content. To this point, I have probably explained why a good 99% of the world does not create content. Which answers your question. But the journey to creating actual original content goes even further than that. It’s even a longer journey than the one before this. Most people get stuck in the repurposing content department and stay there for good. (1) An actual opinion This is the step that gives you the urge to create. Not just facts. This is actually more difficult than you might think. A lot of people are more comfortable just throwing facts around instead of having an opinion. You need to learn how to give the nay-sayers the finger and just write what you feel. Unless you’re a researcher, original content is usually just giving your own spin on things, not recreating the wheel – Your own recipe on fried chicken, your review on the movie, your commentary on the Obama Administration etc. Back to my personal experience, when I first started, I had absolutely no idea what I wanted to write about, even when the interest is there. But I pushed through and made a few ambiguous postings. You really need (1) + (2) to get the first post cracking. But these two points are still not enough. Even if someone has the skill, he often goes, “oh someone is already doing it, someone is better at it…” It’s easier to just refer to someone than write the content yourself, because it is already there! (3) The URGE to write From experience, this only comes to you over time, and it is a surprisingly addictive process. The more you write… the more YOU WANT to write. For me now, what was once arduous 200-word posts, now become easy-peasy thousand word opinion pieces, which I have to slap my hands to stop writing. (Much like this post). Anyhow, here are my blog posts in order from March to April so you know of my thought process. From scared blogger to person who can’t shut up. Midweek Ravings: Happy One Month Old Blog! Happy Two Month Old Blog! P.S: I’m not saying my content-creation is the top 0.5% or anything. It’s just my journey towards creating content for a subject I’m interested in. And I am actually trying to create content, just need to create higher quality stuff. Update: I think I might have been ‘down-voted’ on Quora for this post. Just another of case of TL;DR. Such is the attention span of the world today. This entry was posted in Perspectives and tagged Bloggers, Blogging, Content, Online Content, Opinion, Quora, Raving, Tumblr, Wordpress, Writers, Writing. Bookmark the permalink. ← Happy Two Month Old Blog! I think you’re probably right about the percentage of people creating original content; it’s certainly quite hard to find blogs focused on the actual writing! Of course, I might be saying that because I haven’t really worked out how to put upload images on to my netbook and from there on to my blog! Thanks for visiting! For blogs that focus on actual writing, you can look at the community box on the bottom right of my blog. Most of the people there are all either writing, amateur writers or professional writers. As for the blog maintenance.. you’ll figure it out! I only started inserting images into my posts after a few days. You can always go back to beautifying them later on. I also went back to insert a feature pic for all my posts since a lot of blog themes use them, such as my current one. You don’t have to do it now though. Just a quick tip, don’t just bookmark your own blog, bookmark the admin page as well. e.g. http://undercovermole.wordpress.com/wp-admin/edit.php. Gives you fast access to the tools you need. Just keep exploring, and keep writing. People will come to you. Great post. I think that the reason most people don’t write original posts is because most people don’t think for themselves. They just restate something they hear. You are one of the few brave souls who have great, original thoughts and the ability to clearly explain these thought to dummies like myself. lol, you’re not a dummy. You have great stories.